Choosing one product can be difficult since there are many appealing options available. Knowing this, we set out to find the Best Santoku Knife on the market. You can use our list to find the best one for your cooking needs. 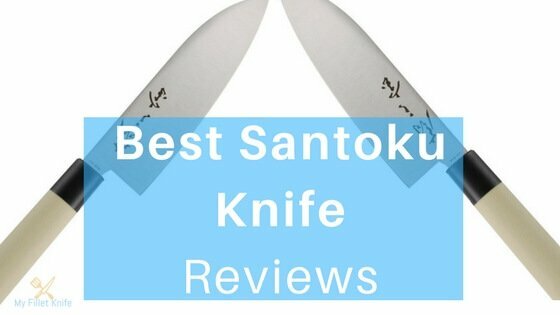 There are plenty of santoku knives out there, so let’s narrow the list down to only the highest rated models. Our first santoku knife is part of Shun’s ‘premier’ line. This high-end blade is crafted with 32 layers of Stainless Damascus. Damascus protects and supports the extremely hard cutting core in the blade. This line of santoku knives is known for being very sharp right from the box. True to Santoku form, a beautiful walnut Pakkawood handle fits comfortably in hand and maintains a healthy balance with the blade. It can effortlessly slice, dice, and chop your favorite ingredients. The blade is forged for a hard-hammered Tsuchime finish. In Japanese, Tsuchime simply means ‘hammered.’ This process creates tiny pockets of air on the edge of the blade, reducing drag and quickly releasing food while slicing and dicing. Overall, The Shun Premier Santoku is a quality knife, an actual example of Santoku tradition. It is lightweight, balanced, and very sharp. This is a premium quality blade, and the price reflects that. The next blade we looked at takes the classic Santoku knife and adds a modern touch. This is reflected in its appearance as well as it’s craftsmanship. The blade is formed with laser precision, using a single sheet of high-carbon German stainless steel. The kullened edge creates less drag when cutting and allows food to slide off the blade easily. The special blend of German steel is tempered to create a very hard edge. Wusthof is still a family-owned company that focuses on craftsmanship and quality. Classic ingredients and time-tested methods are used to forge their blades. The handle is all black and very sturdy, with a full tang extending throughout. It’s triple-riveted, creating a secure grip. This high tech blade uses a molybdenum/vanadium stainless steel blend that is tapered at a long angle instead of a short bevel. This helps keep edges sharper than even high-carbon stainless steel knives. The Global Santoku knife boasts a razor-sharp edge sharpened by hand to a 15% angle. This edge is designed to minimize drag for the cleanest cuts possible. The hollow handle is injected with a precise amount of sand for balance. The sand flows throughout the handle as the blade is used, maintaining continuous balance. This is the second blade by Wusthof, and this one is a real workman’s blade. This santoku knife is designed for usability and affordability. This is a rugged model, with the blade, tang, and bolster formed from a single piece of high-carbon stainless steel. It features a tough polypropylene handle with three rivets for a comfortable grip. A classic model is an affordable option. The 5 and 7-inch models also include a free cutting board. But rest assured, the Wusthof name means this blade is well made, and a bargain for the price. Dollar for dollar, the Victorinox Santoku may be the best knife on the market. This knife is significantly cheaper than the other options, although it impressed us considering the price. This blade features cold-rolled, high-carbon stainless steel, and is hand finished by craftsmen in Switzerland. The tempering process creates a blade that can be sharpened over and over again. The design is pretty basic. A plain black handle does the job but doesn’t offer the premium look or precise balance of other santoku knives. In a few ways, this Victorinox Granton Edge is an upgrade over the previously reviewed Fibrox. For example, the handle is a nice setup. This handle is crafted from a beautiful rosewood handle that’s shaped for maximum balance and comfort. It uses three rivets for increased durability. This Victorinox also uses high-carbon stainless steel to forge its blade. The bolster-less edge allows for smooth cutting on any part of the blade. This edge can be resharpened as often as necessary. One neat feature of this blade is that it’s ice hardened – a method used to increase edge protection. A Santoku knife is a Japanese style knife. This knife is specially designed to help to prepare food in the kitchen. The Santoku knife helps in preparing vegetables, meat, fruit etc. the knife allows cutting food precisely. Santoku knife cuts food into thinner slices than other knives. This is why it is easier to use Santoku knife for slicing than other knives. In Japan Santoku means three virtues. According to the name, the Santoku knife is suited for three purposes in the kitchen. Santoku knife is best for slicing, dicing, and mincing. 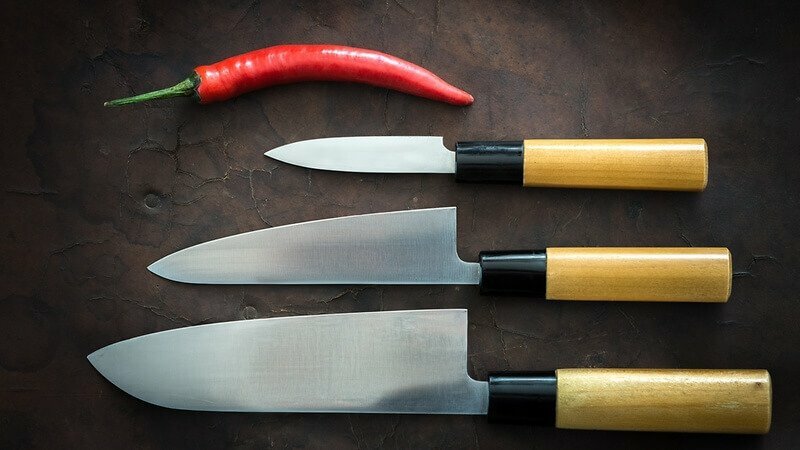 The knives design and properties make it more useful than other knives in the kitchen. This knife is so useful that its use is common in-house kitchen as well as profession kitchen. Unlike other knives, Santoku knife has a unique shape. It has a flat cutting edged blade. One side of the knife is flat and the other side is beveled. The blade of the knife is rounded and curved especially for better cutting. The wide blade allows consistent cutting of the foods. The handle is in line with the blade edge which applies more force to cut. The design and shape make sure that there are fewer chances of injury or cut to the hand. The Santoku knife is lighter comparative to other knives. So, it doesn’t put a strain on hands while cutting. This property of Santoku knife also makes cutting quicker and easier. Food doesn’t cling to the knife due to its hammered blade. The Santoku knife can be used for everyday cooking. The handle is comfortable for cutting. The knife’s Handle fits in the palm of the hand. While cutting, a claw holds the food. A rock motion cuts the food slices. Food doesn’t cling to the knife while cutting. This is a quality of santoku design. Santoku knife can be used to prepare dinner, breakfast or to prepare a feast. The knife slides and glides through food easily. While smoothly slicing the food doesn’t crack or break. The knife can cut fruits and vegetables nicely. This way santoku can be used to decorate dishes. A santoku kitchen knife has a lot of uses such as chopping, dicing, cubing, mincing, slicing, scooping and so on. We can use this knife for chopping and slicing materials effortlessly and quickly. This knife is a combination of chef knife and cleaver, so one can mince both hot and cold meat with it. The knife has high-carbon stainless Damascus steel blade which made it water resistant, heat resistant and acid resistant. So, it can be used in cutting acidic fruits too. The narrow blade of this knife makes it suitable for slicing and mincing food materials thinly and smoothly. Its light-weight and balanced grip system help one cut fruits and vegetables with ease and comfort. The slightly curved structure of the knife makes fine tasks easier, even for the beginners. The food doesn’t cling to the knife. Slice can be thinner or thicker as desired. The knife is light, so it is comfortable to handle. The lightweight and the unique design of the handle doesn’t put a strain on the hand. It produces fine pieces of food. It needs less pressure to cut food. It can make thinner slices of food. Santoku can cut vegetables, meat, fruits, etc. Santoku kitchen knife finely dices, slices and minces food. 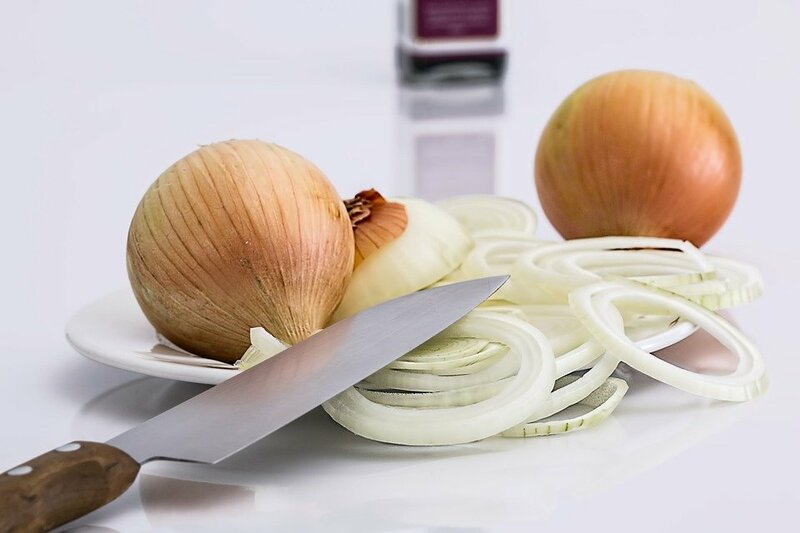 The special structure and shape of the knife reduces friction, impedes getting slippery, controls things moving out of the way during chopping. One does not need to put force, unlike thick blades. The santoku knife is popular all over the world because of its versatile uses. A Santoku knife can be one of the most effective tools in your kitchen. This knife is a wonderful food prep tool designed for slicing and dicing. Years of tradition and craftsmanship shaped this blade into its present form. To be a true example of a Santoku knife, and an effective one at that, some standards have to be met. Our criteria for choosing a Santoku kitchen knife is simple. 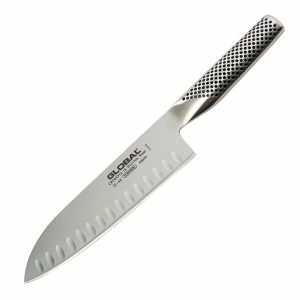 After reviewing all of the top-rated options, we chose the Global G-48 as the Best Santoku Knife. We felt that the high-end blade gave the smoothest cut right out of the box. The handle feels light-weight, and natural, making dicing and chopping feel effortless. Most of all, this knife also has a slip-free grip. Most importantly, this santoku knife was easily the most fun to use. I love these two knifes. Victorinox and Wolfgang Puck. Firstly, Victorinox is very sharp and cuts precisely. Includes a plastic sheath to protect the knife when not in use. Secondly, Wusthof is the one with a very good, balanced weight. 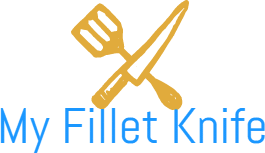 I was thinking of purchasing Santoku Knifes for my kitchen and here I found how to choose the best one out there. Thanks to the Author. It really helped. As a vegetarian with a penchant for root vegetables, I am using this knife almost constantly. The granton edge enables me to dice through fields of potatoes, rutabagas, celeriac, and parsnip with ease. The construction is top-notch and the Fibrox handle ensures that it is easy to clean. Nice Santoku knife. Edge was very nice. Bought as a gift, so have only tried it a few times (quality testing before gifting! ), so can’t speak to longevity of the edge. Very comfortable to handle (I have medium large hands), much more comfortable than the fibrox 8″ chef knife in my opinion. The thing I like the most of a Santoku knife is the 16-degree angle of the Blade makes it the sharpest knife out of the box and let it surpass its European counterparts’ performance with ease. I absolutely love my new Santoku classic knife. I have used it for close to a week and still have all my fingers! I cooked a turkey this week and my brother used it for carving – he loved it (even though it is not a carving knife, I don’t believe) It cuts vegetables like soft butter – I would like to own a complete set! I have been using a shun premier for over a year and it is an amazing product that holds its edge so much longer than any other knife I have owned! I have precisely santoku knife. I love it – use it every time I cook. Still very sharp after 1 year of use. This one felt most comfortable in my hand and I like the length and curve. Just last week I bought myself a matching santoku knife, which I also like. I am a professional chef who is using a knife about 7 hours a day. I bought a Shun Santoku knife about a year back, and I will never buy a french chef knife again. As a lady, I have smaller hands, so large knives are harder for me to handle. The santoku has a shorter blade then most french chef knives, so if anyone plan to cut really large items like watermelons, it isn’t the best knife. However, if you are like me and will use it mostly for vegetables and smaller items, it is fantastic.